I read quite a lot of stuff. On a good day I get to do little else. Much of it is triage, but some of it might be quite interesting? Weinberger makes a very plausible case that interventionism—tendance Pearl (2001)—can explain path-dependent effects in a way that probability-raising accounts of causation cannot. The problem of path-specific causation is illustrated by the “Hesslow case”. One side effect of birth control pills is to increase the risk of thrombosis; apparently they alter blood chemistry in a way that makes clotting more likely. But they also decrease the risk of thrombosis! They prevent pregnancy, which also has thrombosis as a side effect. The net effect of these two causal paths might be positive (so the pill increases the chance of thrombosis overall), negative, or even exactly zero. This situation is obviously different from a simple risk-raising or lowering effect—that of statins, say—in ways that are practically relevant. Suppose that taking the pill lowers the risk of thrombosis overall. Telling an infertile person to take it for that reason would be bad advice. The challenge for probability-raising accounts of causation is to explain that difference. How can taking the pill both raise and lower the chances of thrombosis? Probability theorists have attempted to address this problem, of course, and Weinberger rehearses the debate between Nancy Cartwright and Ellery Eells about how to do so. I’ll elide the details here, but Weinberger’s claim is that the resources probability theorists can appeal to—differences in background variables and (per Cartwright) singular or token causation—are not enough. By contrast, Pearl’s approach allows for a neat system of distinguishing betwen the paths. Which is this. To determine whether (and indeed how much) the pill contributes to reducing the risk of thrombosis via the blood chemistry path, you intervene (in the Woodwardian sense) on the mediator of the other path. That blocks that other causal path, allowing you to see the effect via the path you’re interested in. More formally, you set the value of the “pregnancy” variable to “isn't", breaking its causal relation to taking the pill, and look at the difference in the value of the outcome “thrombosis” variable when “takes the pill” is set to first “does" and then “does not". (That difference can be calculated using the stuctural equations in your model.) In the Hesslow case, the difference will be non-zero, which tells you that there is an effect along that path. Things get more complicated when the other path is direct, that is, has no mediator. To see that the pill influences thrombosis via pregnancy, you can’t intervene on a mediator in the other path, since (let’s stipulate) there isn’t one. (Or perhaps there is one, but it interacts with pregnancy, and so shouldn’t be intervened on.) The framework can handle this. Rather than blocking the other path, you fix its contribution, by holding the original cause fixed. Then you intervene on the mediator of the path you are interested in as if there was a change in the original cause. Since the other path is fixed, this allows you to see the impact of the path you’re interested in. So in Hesslow you hold fixed that the pill is taken, and then intervene on the pregnancy variable to give it the value it would have if the pill hadn’t been taken. You compare the outcome with what happens if the pregnanacy variable is allowed to take its “pill taken” value. Again, the stuctural equations will tell you that the difference is non-zero, so there is causal influence down the pregnancy path. Weinberger’s framework also usefully distinguishes between “necessary” and “sufficient” path-dependent effects. The former compares the effect along that path to the total effect; the latter compares the effect along that path to the result where the original cause doesn’t happen. These will provide answers to questions with different contrasts. If you took the pill and got thrombosis, but not pregnant, you probably want to know how the risk would have been different if you hadn’t taken the pill (the sufficient effect along the direct path). But you might also want to know what it would have been if the pill hadn't prevented pregnancy (the necessary effect along the indirect path). In all this, of course, Weinberger is very much in the spirit of Pearl’s own criticism of attempts to understand causation in terms of probability, or any other sort of correlation. (See chapter 1 of the Book of Why for a very friendly discussion.) But the detailed application of Pearl’s framework to the philosophical discussion of the Hesslow case, and other path-dependent effect cases, is independently valuable. It took me a little while to puzzle out some of the logic—the discussion of Eells versus Cartwright in particular had me scribbling on paper. It’s really helpful, I think, to pay attention to the negation load you’re imposing on your reader. (I appreciate I am also guilty here.) But this is an excellent, and I think correct, example of how the interventionist framework can help with longstanding philosophical puzzles. By sheer luck, this followed on nicely from the Devlin Brown paper from yesterday. Brown distinguishes between “horizontal” and “vertical” responses to the exclusion problem. Vertical responses look at the relation between the physical and mental causes. They try to show that the two are ontologically related in such a way that they their co-existence as causes is not really problematic—because they are not fully distinct causes. 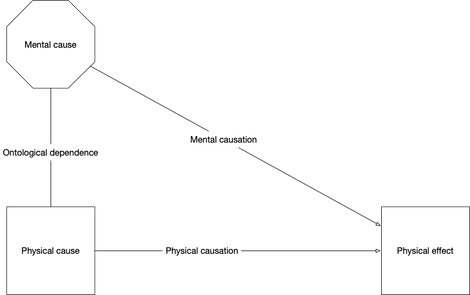 “Vertical” because that is how the relation between mental and physical causes is usually depicted in toy causal diagrams (as in the example below). Horizontal responses, by contrast, look at the causal relation itself, generally depicted horizontally, or diagonally in the mental → physical case. I agree with Donaldson’s distinction, and with his claim that a horizontal strategy cannot succeed alone. As I said yesterday, I think the key to avoiding objectionable overdetermination is that the two causes are not fully distinct; and the ontological link between them will also explain their co-appearance. But it seems to me that a vertical strategy alone is not sufficient, either. A suitably compatibilist account of causation is needed too. Consider the reductive physicalist's response to the exclusion argument. They avoid overdetermination by identifying the (token) mental and physical causes. This is the ultimate vertical strategy; there is no coincidence problem for identicals. But it’s reductive physicalism. Non-reductive physicalism needs the two causes to be ontologically indistinct, but it also needs them to still count as two causes. And for that we need to explain how their causal contributions can be distinct. If the causal relation between the two causes and the effect is the same, then non-reductive physicalism looks like epiphenomenalism: the mental cause is not contributing anything. What’s needed, then, is an account of causation on which ontologically connected mental and physical properties can both count as making separate causal contributions. In other words, a “horizontal” approach to the exclusion problem. Donaldson spends some time discussing the “proportionality” horizontal approach, adopted by both Zhong and List and Menzies (2009). I agree that this won’t do it—it avoids overdetermination by ruling out either the physical or the mental cause as a cause, where I want both to count. But I think a (related) approach of contrastive interventionism can do the job. There are interventions on the mental cause that change the outcome, and also interventions on the physical cause that change the outcome, and the two sets of interventions aren’t identical. More on that next, I think. This is an interesting paper which, together with John Donaldson’s forthcoming “Horizontal vs Vertical”, has usefully focused my attention on the real nature of the compatibilist’s solution to the causal exclusion problem. Brown’s claim is that the compatibilist approach, advanced by non-reductive physicalists like Karen Bennett (2003), can also be exploited by dualists, as a way to avoid the causal-closure argument for physicalism. The causal exclusion problem poses similar challenges to the dualist and the non-reductive physicalist. They both want to say that mental causes are distinct from physical ones. But, given the causal closure of the physical, they want to say that mental causes’ effects have sufficient physical causes as well. The combination makes mental properties look redundant: at worst, they are epiphenomenal and so not mental causes at all; at best, their effects are systematically overdetermined, which is bizarre. The “compatibilist” response from the non-reductive physicalist is to accept that mental and physical causes double up as causes of their effects, but then deny that this is objectionable—on the basis that the mental and physical causes are not wholly distinct, since the former depends ontologically on the latter. That means the problematic overdetermination counterfactual—if the mental cause had not occurred but the physical cause had, the effect would still have occurred—is only vacuously true. The antecedent can never be satisfied, since if the mental cause is removed the physical cause goes away with it. This approach doesn’t seem like an option for a dualist. Dualists thinks mental and physical are ontologically distinct. That’s kind of the point. Browne’s suggestion, however, is that the dualist can suggest a different sort of necessary connection—one that is not ontological but nomological. Say laws of nature are metaphysically necessary, and there are psychophysical laws connecting the mental and physical causes. That’s enough to make the overdetermination counterfactual vacuously true, since removing the physical cause necessarily removes the mental one too. Why think the laws of nature are necessary? Perhaps because you accept dispositional essentialism: the idea that properties have their nomological roles necessarily. Those are both controversial views, and not ones I endorse. But they are respectable positions, so the dualist’s position against the causal closure argument has at least been strengthened. But. Now the picture is one of redundant causation. The physical cause produces both a physical effect and a mental cause, which also produces the physical effect. The systematic causal detour tbrough the mental property looks just as otiose and objectionable as an autonomous mental cause would be. Making that extra causal route necessary by way of dispositional essentialism does not look like an advance, even if it does handle the counterfactuals. Consider an example: say that throwing rocks at windows breaks them in the usual way, but also (with nomological force) causes a particular phenomenal experience in the thrower, which also (and independently) breaks the windows. The moral here, I think, is that Bennett’s vacuous counterfactual analysis is just a way of handling the formalities. The substantive insight which the compatibilist physicalist can offer is the non-distinctness of the mental and physical causes. That is what makes the existence of multiple causes harmless. In other words, the exclusion problem needs what John Donaldson calls a “vertical” solution, on which more soon. Another gem from Esa Diaz-Leon. I really enjoy Esa’s papers—which I’ve been reading since we were both looking at phenomenal consciousness: they’re models of clarity, carefulness and concision. (As well as, as far as I can tell, being basically right about things.) Here she distinguishes between “causal" and “constitutive" social construction, and points out that only the latter is inconsistent with the sort of things social construction is supposed to be inconsistent with: natural-kind status, biological realism, intrinsicality. Which makes constitutive constructions the best things to lean on for social change. One nit: at p1140 she puts the question as “is the property that all things that fall under X have in common just a matter of being classified in that way by individuals like us, or do they share an underlying nature or ‘essence’, independently of how we classify things?” This seems to lump kinds produced by looping—where the process of classification causally produces properties—on the constitutive side, rather than the causal (where presumably it belongs). Oy. Things I have been missing all my life, and I’m not sure how I missed them. Maths for people who like maths, but who think technical Wikipedia is mostly useful for illustrating the distinction between explanations and Ramsey sentences. The link is to the post on the Fourier transform, which has given me the feeling of understanding. “Enough circles make a shape” is as far as I had previously gotten, and tbh I’ve survived—but now I have an intuitive sense of how. Bonus: intuitive understanding of Euler’s formula. For free. Seriously. Neuroscientists attempt to understand the brain by, basically, measuring the behaviour of neurons—or the effects of their absence—when subjects perform cognitive activities. This interesting, and sometimes hilarious, paper (bioR𝜒iv preprint, May 2016) applies neuroscientific methods to a MOS 6502 processor (of Apple I fame) running early video games. (Tough work, but someone’s got to get funding for it.) The result is a bunch of correlational truths about the processor’s transistors, but almost no insight at all into how it adds numbers, never mind how it generates the graphics for Donkey Kong. I don’t know what neuroscientists are supposed to do with this, exactly, but it nicely makes the point that are more than a few layers of explanation between architecture and behaviour. Worth reading.